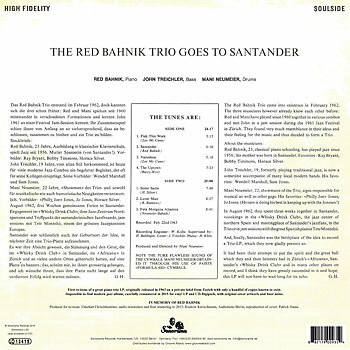 “The Red Bahnik Trio came into existence in February 1962. The three musicians however already knew each other before: Red and Mani have played together since 1960 in various combos and met John in a jam session during the 1961 Jazz Festival in Zurich. They found very much resemblance in their ideas and their feeling for the music and thus decided to form a Trio. Red Bahnik, 23 years old, classical piano schooling, has played jazz since 1956; his mother was born in Santander. Favorites: Ray Bryant, Bobby Timmons, Horace Silver. John Treichler, 19, formerly playing traditional jazz, is now a sometime accompanist of many local modern bands, His favorites: Wendell Marshall, Sam Jones. Mani Neumeier. 22, showman of the Trio, is responsible for musical as well as other gags. His favorites: “Philly Joe” Jones, Jo Jones, Horace Silver (he sure is doing his best in keeping up with the Joneses!). In August 1962, they spent three weeks together in Santander, “cooking” in the “Whisky Drink Club”, the jazz center of Northern Spain and meeting place of Santander`s jazz fans, as a Trio or in jam sessions with the great Spanish pianist Tete Montoliu. 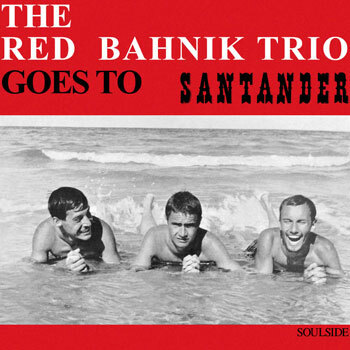 And finally Santander was the birthplace of the idea to record a Trio-LP, which they now gladly present to us. It had been their attempt to put the spirit and the great ball, which they and their listeners had in Zurich`s “Africana” or Santander`s “Whisky Drink Club” and in many other places, on record, and I think they have greatly succeeded in it and hope, this LP will not have to wait long for its echo. Roskow Kretschmann, Audiomoto Berlin, reproduction of cover artwork: Patrick Haase, supported by Arne Reimer.